I will be off-line for the next week on vacation with my daughter, best friend and her daughter. 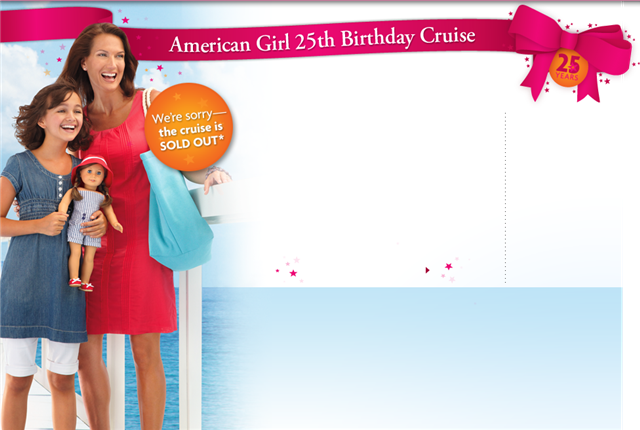 We will be taking a once in a life time vacation on the American Girl 25th Birthday Celebration Cruise. It is the only time anything like this has been offered. Our daughters are in love with American Girl and so are we mothers. When this opprotunity came up we just had to do it. So we are leaving dads and brothers home during this Thanksgiving holiday and setting sail on the Celebrity Eclipse for the caribbean. We have 3 ports of call next week… Puerto Rico, St. Maarten and St. Kitts. But don’t worry, I have a post planned to spark your creativity and when I return I will post pictures of our adventures. This entry was posted in Misc and tagged American Girl, birthday, Caribbean, Celebrity Cruise, Misc.. Bookmark the permalink.